If you want to know what having infant twins is like, just look at the time that’s passed since my last blog post at 24 weeks and now. Five months! It feels inexcusable for someone who planned to keep a record of life with twins, but my reality for the last four months has been that once I felt human enough again to start blogging, something always demands my attention, usually two babies at once. They’re a good excuse, anyway. 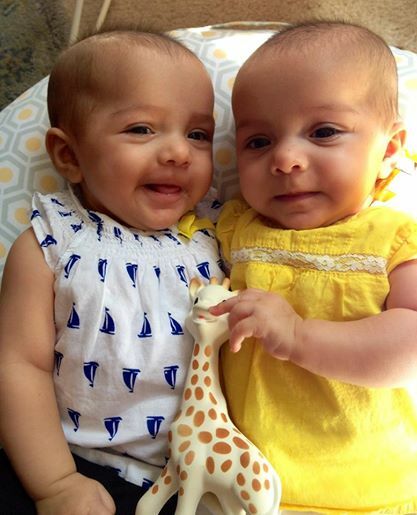 Meet Catalina Grace and Lucy Kendall, our identical twin girls. The girls turned four months old this week. Life as it was at 24 weeks pregnant feels like 24 months ago. Since then, we’ve survived preeclampsia, NICU time for Lucy,and readmitting Catalina. We’ve settled into life with two newborns, then life without grandmas & daddy home helping. And every time things settle into a nice new routine, they change. Giggles! Catalina laughed for the first time today. I was putting lotion on her shoulders and must have tickled her neck. So I kept doing it, and she giggled, and I got so excited I clapped my hands. Teething. These girls are the most laid-back babies I can imagine, but it’s hard to be perfect when teeth are poking through your little gums causing all sorts of trouble. So far it’s nothing some extra cuddles and homeopathic teething tablets can’t fix. But that’s for another post. Naptime? What is a nap? This could have its own post too. The four-month sleep regression is real and we have hit it, but mostly just for naps, thank the Lord. Sitting and standing. These girls LOVE to stand and sit with help. It’s all they want to do at play time. Rolling is coming more slowly, but they try. The moms in my twin group recently talked about whether having twins has been easier, harder or what we expected. Surprisingly, the consensus was mostly that it feels hard in the moment because of things that don’t go as planned, but it’s easier than we expected as we look back (the warnings are dire, people). I think that sums it up perfectly. Friends, having twins is SO FUN. Not having other kids, I can’t compare the workload to a singleton, but I do know they’re totally worth it. As my aunt Melissa said, I’m beginning to feel sorry for anyone who doesn’t have twins, they’re that wonderful. Ever the eloquent writer, this is a delightful read. So nice to have you blogging again. Have I ever told you that you’re amazing??? I had no idea you dealt with so much medically at the very end (and beginning)! I am looking forward to our afternoon together on Thursday to hear more about it and meet these beautiful ladies of yours! So freaking cute. Also, they want to sit and stand already?! Ellie didn’t sit on her own until she was at least seven months old, the lazy bum!